Every programming language that you’ll use will have some sort of tool that allows you to debug the code you write. Without debugging, finding the errors in your code would be VERY time consuming. The magic of using a debugging tool is that it allows you to run your code line-by-line at a pace that you’re comfortable with. This means that the computer won’t just FLY through every single line of code and leave you guessing what the heck just happened. 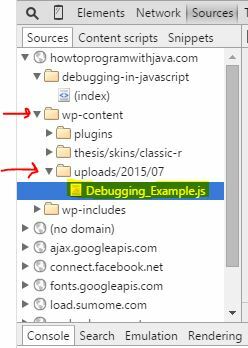 Debugging tools will allow you to dissect and inspect every single aspect of your code as it’s running. This is massively useful, as it allows you to spot any potential errors/bugs in a much more human way. As I’ve mentioned before, I would recommend you use either the Google Chrome browser or Mozilla’s Firefox browser. If you’re using Google Chrome, then you’ve already got the debugging tool built right into your browser, just hit the F12 key (or CMD + OPT + I on a Mac) and you’ll see it pop up. Now click on any of the line numbers (on the left side) to add a breakpoint. This is where the code will “pause” so you can debug line by line. Then you’ll need to refresh the page to start the debugging process. Once the page refreshes, you’ll see that it will “pause” at the breakpoint that you previously inserted. Now you can step through the code line-by-line using the “Step Over” icon in the top right of the Dev Tool. As you step through the code line by line, you’ll see that the console messages will appear right when you hit the “step over” icon. Plus you’ll get to see exactly how the for loop iterates over your code. Debugging is not only a handy tool, but it can also serve as an educational tool for learning how the code functions as it’s being run. 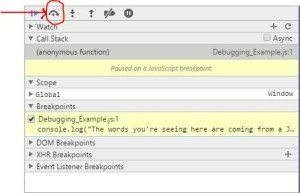 Update: When this post was originally written, Firefox didn’t have a built in code debugger and you had to download ‘firebug’ in order to enable this debugging functionality. This is no longer the case, you should be able to follow the instructions above and still be able to debug with Firefox without installing any additional plugins. Firefox uses a plugin called “Firebug” that will need to be installed. It’s very similar to Google Chrome’s Developer Tools. To download Firebug, go to this link: https://addons.mozilla.org/en-us/firefox/addon/firebug/, or if that link happens to be dead then just Google “Firefox Firebug” and you’ll be sure to find a working link to install the plugin. Once you’ve installed the plugin, you can launch it in the same way that you launch the Google Dev Tools, by hitting F12 (or CMD + OPT + I on a Mac). The beauty about the Developer Tools / Firebug plugin is that they both function in nearly identical ways. To debug your code using the Firebug plugin in Firefox, just follow the same steps that we’ve outlined above in the “Debugging in Chrome” section!